I had a little extended blogging break there while we enjoyed Pittsburgh. It was wonderful. As usual you don't realize how stressed you aren't anymore until there's pizza, a pitcher of beer and your best friend in front of you. I have some stuff going on, I'm back at work today (ack) and I went back to strength training today (yay). Race reports for Pittsburgh. I want to capture everything properly so yeah, work to be done...but it's fun work. Calgary Marathon weekend. I registered for this during the time of flu-plague delirium and am now questioning my decision making. More on that last point later. I'm feeling really good after a marathon and a rest, all the little niggly issues I had in training have gone. It's lovely. I'll do a test run at the weekend to see if this feeling of being refreshed extends into my running. 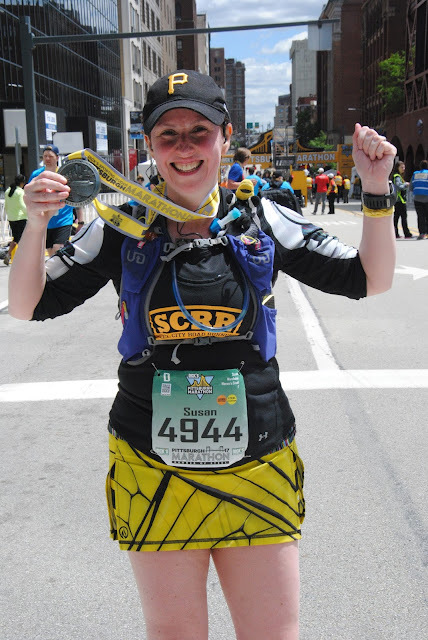 Did you know it only cost $30 for my Marathon Foto downloads this year? I like.